Even if you're not a Trump fan, you've got to admit... this kid is cute. Stand aside Donald Trump! There is another member of the American presidential family that’s stealing the spotlight – and in China of all places! 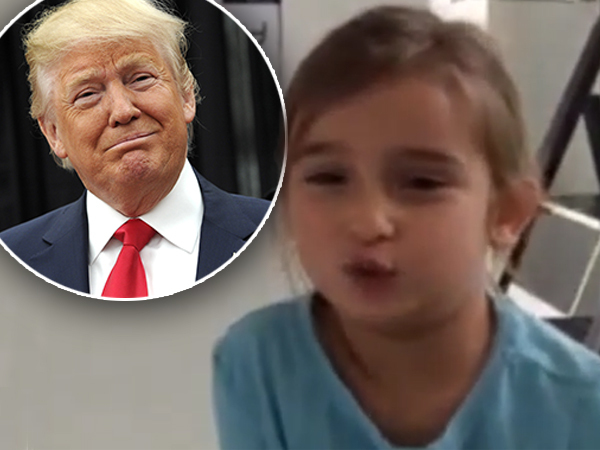 The billionaire businessman and father of five is perhaps not so popular amongst his countrymen since he won the US presidential election, but the same can’t be said his five-year-old granddaughter. Arabella has become an internet sensation in China after a video of her reciting a poem in Mandarin spread like wildfire online. Arabella’s mother, Ivanka (35) shared the video on Instagram in February. The video was a hit then but then but it’s become popular all over again after her grandfather was elected president. Apparently Arabella, the eldest of Ivanka and her husband Jared Kushner’s (35) children, has been taking lessons in Mandarin since 18 months old. Her mother initially shared the video to celebrate the Chinese New Year. Arabella wore a Chinese costume and sang Chines songs and recited poems for her parents and little brother, Joseph (3). “It was very cute”, Ivanka said when she initially shared the video on Instagram. In the video Arabella recites the popular poem Sympathy for the Peasants from the Chinese poet Li Shen. The poem is a part of the primary school curriculum in China. And the Chinese are now going crazy over her. “Trumps granddaughter is welcome to come to china to learn Chinese!” commented someone online. People are also commenting on Ivanka’s video all over again. Another video of Arabella which her mother shared on Instagram two years ago is making waves. In the clip she recites another Chinese children’s rhyme titled The Little Rabbit Is So White during a lesson. Ivanka loves sharing pictures of her little ones on social media. Here are five things we found out about Arabella from her mother’s Instagram page. 1. She loves to sing! In one video shared by her mother she sings the hit song Cheap Thrills by pop star Sia. Friday night, hit the dance floor ?? She also recently sang the popular song, Pen Pineapple Apple Pen, by Japanese comedian Pikotaro. 2. Arabella even spoils her mom with breakfast. Too cute! Delicious breakfast courtesy of Arabella! 3. She also helps out when Jared is working up a sweat in the gym. 4. She is besotted with her two brothers, Joseph (3) and Theodore (7 months), and even lent a helping hand when her baby brother started eating food. She went as far as picking the apples for little Theodore’s apple sauce. 5. She is the spitting image of her mother! Read more: What would a Donald Trump victory mean for SA?